The fall of the Berlin Wall in November 1989 and the breakup of the Soviet Union in December 1991 became the precursors for the collapse of the Cuban economy, central to which were the Soviet oil-forsugar swaps over the preceding three decades. At its zenith, this barter arrangement provided the financial basis for Cuba to sustain the agricultural inputs necessary to produce sufficiently large annual harvests to permit significant sugar export levels and oil re-export revenues. At its nadir, the systemic failure in the oil-for-sugar arrangement created shortages throughout the Cuban economy including fuel, fertilizers, herbicides, and spare parts for farming equipment and sugar mills. Over the past decade, this is marked by the simultaneous downward spiral of Cuba’s oil imports along with its sugar exports. Cuba’s historic energy dependence and limited oil resources coupled with the sudden disruption of the oil-for-sugar barter arrangement severely impacted the Cuban economy from which it has yet to fully recover. The fall of the Berlin Wall and the breakup of the Soviet Union also brought the disintegration of Cuba’s sugar market within the Moscow-dominated Eastern European economic bloc, called the Council for Mutual Economic Assistance (CEMA), where Cuba was the chosen sugar producer. 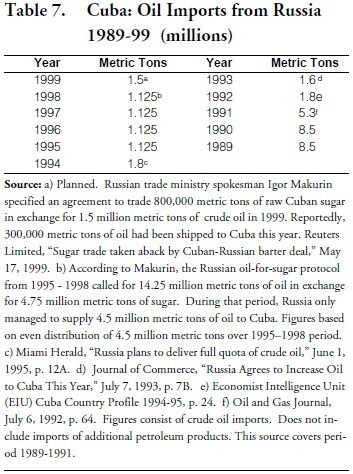 Over the 1989- 1999 period, 1991 set the high water mark for Cuban sugar exports to Russia at 3.835 million mt. and 1995 the low water mark at .727 million mt., a steep decline of 81 percent. 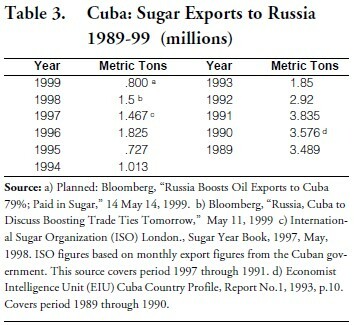 Even at .800 million mt., projected 1999 sugar exports to Russia barely exceed 1995 export levels. 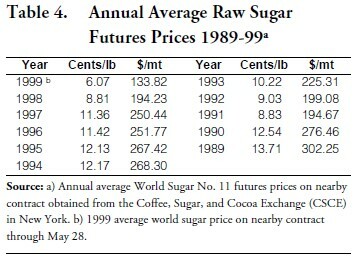 As Cuba’s sugar production and exports headed downward, world sugar prices, which averaged 13.71 cents per pound in 1989, had fallen to 8.83 cents per pound by 1991, experiencing gradual recovery through 1994 when prices reached 12.17 cents per pound. 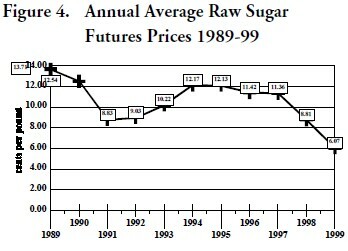 In 1995, however, prices began their present downward cycle, averaging 6.07 cents per pound through May 1999. World sugar prices are described as being at 14-year lows due to the continued excess of production vs. consumption along with protectionist government policies to subsidize exports. According to John Love, U.S. Department of Agriculture commodity analyst, speaking at the annual International Sweetener Symposium in Napa Valley, California, “historically a 3-5 year period is necessary for the sugar market to turn from bearish to bullish. World sugar production is expected to exceed consumption in 1999/2000. Surplus will add to stocks for the third consecutive year.”3 At that rate, world sugar prices could experience another two years of declining prices and Cuba’s sugar production could continue to hover around 4 million metric tons per year over the next several years—still only 50 percent of the 1989 to 1990 production figures. In light of Cuba’s historic energy dependence and limited oil resources, its energy picture was worsened by the seismic shift in international events taking place between 1989 and 1991. Cuba’s annual domestic production declined from an already meager .718 million mt. in 1989 to a low of .529 million mt. by 1991 averaging .639 million mt. annually during this critical three-year period. At the same time, Cuba’s oil imports showed a steady drop of 38 percent from 13.10 million mt. in 1989 to 8.10 million mt. by the end of 1991. When imports bottomed out in 1993 at 5.50 million mt., combined figures for production of 1.108 million mt. added to imports for 1993 equaled only 6.6 million mt. 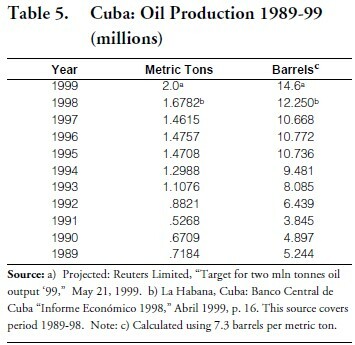 This was still short of Cuba’s minimum annual oil requirement of 7.5 million mt.4 Between 1989 and 1998, Cuba could only produce between 10 and 22 percent of its crude oil requirements. The breakup of the Soviet Union marked a turning point for Cuba as it sought Western oil partners with expectations these alliances would provide new technologies and result in quality oil finds leading to increased domestic production. Cuba Unión del Petróleo (CUPET), Cuba’s state-owned oil company, auctioned oil blocs to Western oil companies.5 Although no significant finds have been reported, Cuba’s domestic oil production has been growing gradually from its low point during this ten year period of .529 million mt. in 1991 to 1.678 million mt. in 1998 with projections for 1999 set at 2 million mt. Oil import levels remain below the 7 million mt. 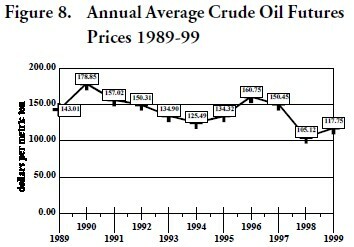 level largely due to Cuba’s poor hard currency position and the direct effect of relatively high average annual crude oil prices from 1989 through 1999. Despite the gradual increase in domestic production, Cuba must import from 73 percent (5.5 million mt.) to 92 percent (6.9 million mt.) of its annual crude oil needs (7.5 million mt.). The crisis in the Soviet oil industry caused Cuba’s crude oil imports to drop precipitously between 1989 and 1992, from 8.5 million mt. to 1.8 million mt., or by 6.7 million mt. (78 percent). This differential nearly reached the level of Cuba’s minimum annual oil requirement of 7.5 million mt. 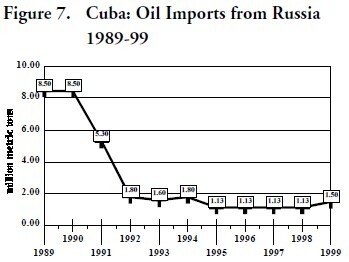 Prior to 1991, Soviet crude oil provisions had exceeded 11 million mt., in addition to special concessions granted in the form of a hard currency oil account which allowed Cuba to reexport oil at world market prices and retain the hard currency proceeds.10 For example, 1985 Soviet oil exports to Cuba, including deliveries from Latin America, totaled 13.1 million mt.11 After 1991, the Soviet Union had ceased to exist and along with it the three-way oil supply exchange agreement whereby the Soviet consignment to Cuba had been arriving largely in the form of Venezuelan crude via its state owned oil company, PDVSA, while the Soviets had been supplying crude to Venezuela’s joint venture refinery, Veba, in Germany.12 Cuba’s Russian oil imports have never recovered. 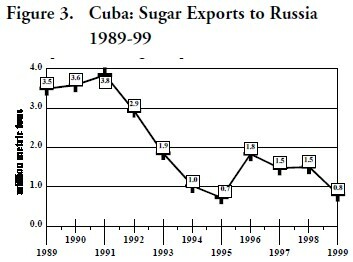 As direct Soviet oil deliveries to Cuba nearly came to a standstill by the end of 1991, the Soviet Union indicated its reduction in the purchase of Cuban sugar leading to the collapse of the Soviet oil-for-sugar arrangement. Oil imports from Russia have not exceeded 2 million mt. since 1992, while sugar exports to Russia have not exceeded 3 million mt. since that same year. 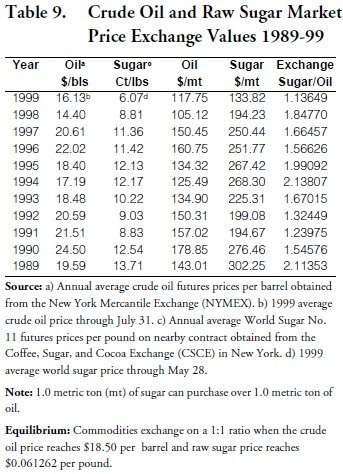 From 1989 through 1999 one metric ton of sugar was of greater value than one metric ton of oil with equilibrium reached when crude oil sold for $18.50 per barrel and sugar sold for 6.12 cents per pound. That level was not reached during this period. 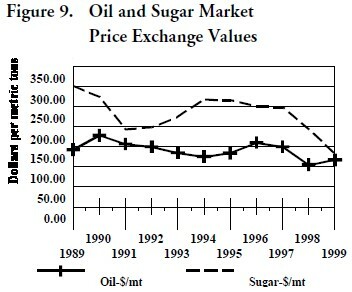 The value of sugar was more than double the value of oil in 1989 and then again in 1994 and nearly reached that level again in 1995 when sugar was valued at 1.99 times that of oil. In 1989, Cuba produced 8.1 million mt. of sugar which sold at 13.71 cents per pound. While in 1994, Cuba produced 50 percent less sugar—4 million mt.—when it was priced at 12.17 cents per pound. The rise and fall of commodity prices notwithstanding, Cuba has maintained a distinct advantage in the oil-for-sugar barter marketplace as the unit value of sugar consistently has exceeded the unit value of oil. The disadvantage to Cuba has been its highly erratic sugar production levels. 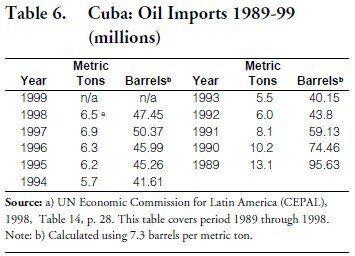 The hidden effect of the cutoff of Soviet oil shipments was the sudden increase in Cuba’s oil import costs at world market price levels combined with the end of excess oil supplies beyond its domestic needs that had previously provided substantial reexport revenues from concessionary Soviet oil imports. As a result of decreased oil imports from Russia, Cuba curtailed energy consumption and paid more for its oil imports in order to meet its minimum crude oil requirements. 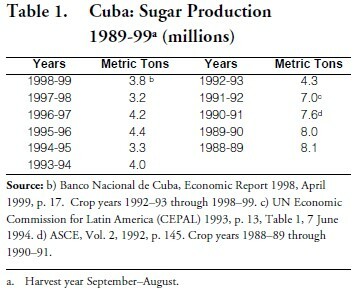 The result was Cuba’s inability to sustain its sugar production at levels approaching those of 1988-89 through 1991-92. The apparent end to the Russian oil-for-sugar barter arrangement raises the question of how Cuba will be able to afford and obtain its minimum annual oil supply requirement of 7.5 million mt. 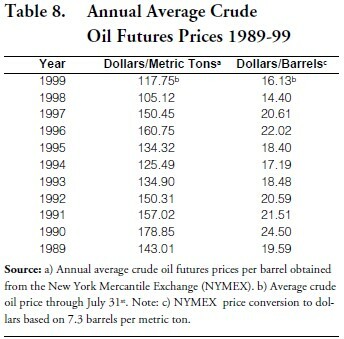 The difference between its 1999 projected domestic oil production level of 2 million mt. and annual requirement is 5.5 million mt. At 1999 market prices, Cuba’s bill would be well over half a billion dollars or $647.625 million. 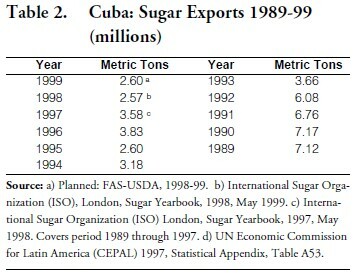 At current sugar price levels (May 28, 1999 at $133.82/mt), Cuba would need to export 4.84 million mt. to pay the import costs to meet its oil needs (see Table 5). Cuba has neither exported more than 4.84 million metric tons of sugar since 1992 nor has it produced more than 4.84 million metric tons of sugar since crop year 1991-92. One possible alternative to Cuba’s dilemma would be its inclusion in the San Jose Pact.15 The pact, which does not involve sugar, is operated by Latin oil giants Mexico and Venezuela that have since 1980 granted oil discounts to Central American and Caribbean countries. Linked to oil prices, the pact “sets aside a percentage of the oil bill to generate resources for financing the commercial exchange of goods and services and/or development projects in the countries participating in the program.” Although Cuba’s inclusion already has been rejected this year, Venezuela appears interested in reaching a bilateral arrangement with Cuba. 1. Anuario Azucarero de Cuba (Cuba Sugar yearbook) 1961, Vol. XXV, Ministerio del Comercio Exterior, La Habana, Cuba, 1961. 2. “Poca azucar, pero la mejor en 5 años,” El Nuevo Herald (27 de Mayo de 1999). 3. PRNewswire, “USDA Predicts More Low Sugar Prices, Cites Foreign Protections,” August 9, 1999. 5. “Beginning of an Oil Rush?,” Cuba Business, Vol. 5, No. 2 (April 1991); “Oil for Survival,” Cuba Business, Vol. 6, No. 2 (June 1992). 6. “More Soviet Industry Trade Barriers Collapse,” Oil & Gas Journal, Vol. 88, Issue 40 (October 1, 1990). 7. “Moscow Paper Warns of Oil Exports to Cuba,” Oil & Gas Journal, Vol.89, Issue 25 (June 24, 1991). 8. “Cuba, Soviets Deals Highlight Total E&D Push,” Oil & Gas Journal, Vol. 88, No. 53 (December 31, 1990). 9. “First License Round in 30 Years Sheds Light on Cuba’s Geology,” Oil & Gas Journal (April 26, 1993). 10. Economic Report (La Habana, Cuba: Banco Nacional de Cuba, May and October 1989 and previous editions). 11. “Moscow Paper Warns of Oil Exports to Cuba,” Oil & Gas Journal, Vol. 89, Issue 25 (June 24, 1991). 12. “Cuba’s Oil Crisis Spells Trouble for Castro, Opportunity for Foreign Petroleum Investment,” Oil & Gas Journal, Vol. 90, Issue 27 (July 6, 1992). 13. “Cuba’s 1998/99 sugar crop tops 3.7 man tones,” Reuters, May 17, 1999. 14. Pascal Fletcher, “Cuba economy feeling liquidity squeeze—bankers,” Reuters (May 26, 1999). 15. Ralph J. Galliano, “Cuba Considered for San Jose Oil-for-Trade-Pact,” U.S. Cuba Policy Report, Vol. 6, No. 6 (June 30, 1999).